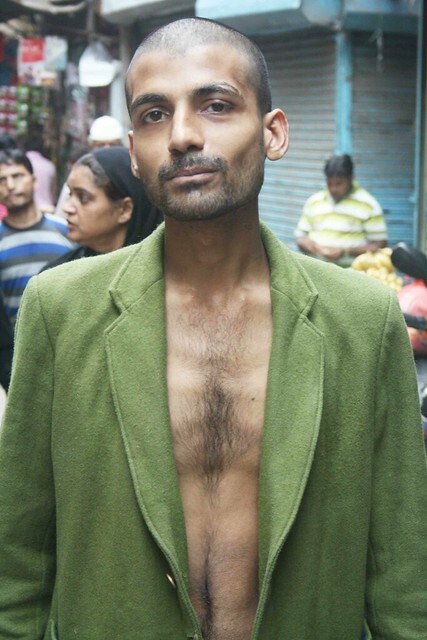 The Delhi Walla saw this young man in a street in Chitli Qabar, a neighbourhood in Delhi’s 17th century Old Quarter. 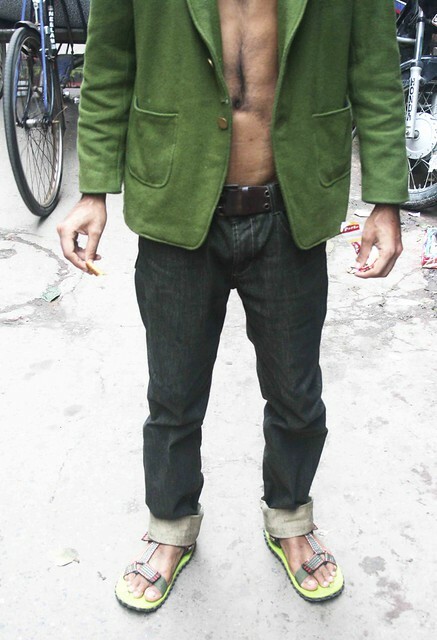 He was wearing a mustard-green woolen blazer, black denim jeans and green sandals. His jeans was rolled up to his ankles, his head was tonsured, and he was sporting a stubble. There was no one dressed like him. The man was actually shirtless and the golden brass buttons of his blazer were open. There were clumps of hair on his chest that tapered down to a light fuzz towards his navel. The region below was shaved. It was sweaty hot. 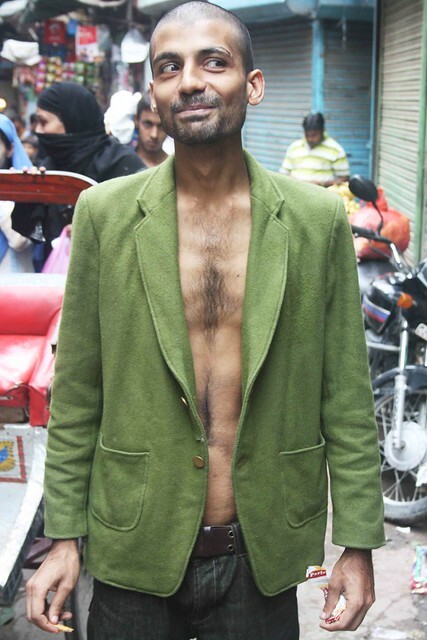 When I asked him that why he was wearing a blazer, he said, “I’ve no other clothes.” The man had no money and no home. He specified that he wasn’t a beggar. Most of us dress to fit ourselves into certain social positions. 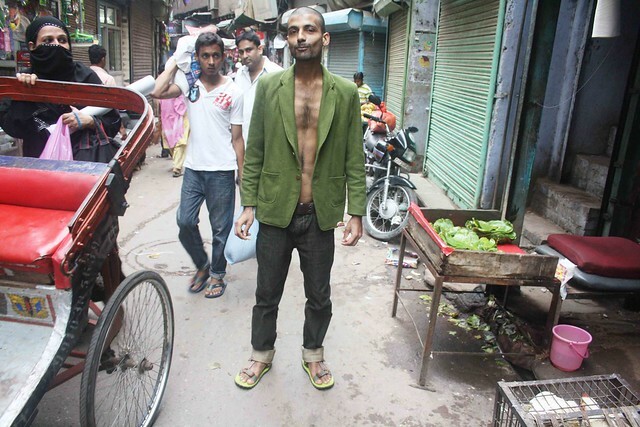 In Delhi, a homeless person usually wears unwashed rags. Personal grooming is an indulgence of the rich. But the nails on the fingers and toes of this homeless man were clipped. His sandals were colour-coordinated with his clean blazer, which he wore with a cool nonchalance. A dark-brown leather belt tied the jeans to his narrow waist. He lived in those clothes and made them work for him. The blazer’s green radiance showed that the man’s sartorial sense was tuned to colors; the casual unbuttoned look and the day-old stubble highlighted his vagabond image. Standing out from the rest of the pedestrians – shoppers, laborers and beggars – he was glowing in a halo of confidence. As he bit into the Marie Gold biscuit he had in his hand, the man’s eyes went moist and his face dissolved into an ecstatic smile. He could have launched a thousand brands. a stunning choice! Unfortunately, the first image that sprang to the mind was that of the hapless, emaciated figures from that terrible place, Auschwitz. The person portrayed here does bear a striking resemblance to those phantasms. P.S. Why did you click him eating a biscuit? I must add that I could have done without the following description, “There were clumps of hair on his chest that tapered down to a light fuzz towards his navel. The region below was shaved. It was sweaty hot”. There is something about the mental image it creates that does not seem right. Flattery will get you nowhere with Mayank.